He's only two years old but little Paidi did his late-grandfather proud when he walked his mother Siun Ni She down the aisle last Friday afternoon. 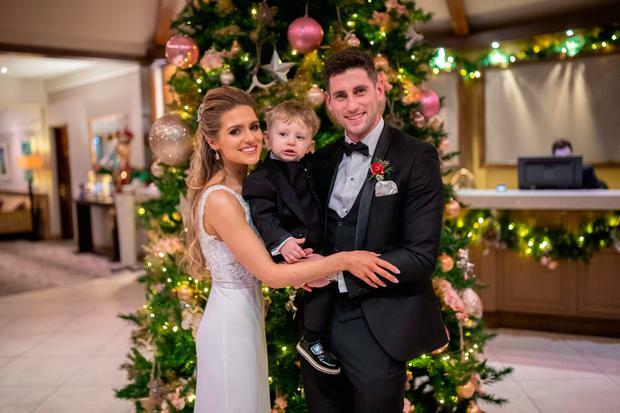 The toddler, who bears a striking resemblance to the great footballing legend Paidi O Se, was tasked with the biggest job of the day when his parents Paul Geaney and Siun Ni were married at St Mary's church in Dingle. Poignantly, yesterday marked the sixth anniversary of Paidi's death and Siun said she was lucky to have her son take on what would have been her father's role. "It was a gamble," she laughed. "He's only two so it could have gone either way but he was really great. He was looking around and smiling and waving at everyone and he held my hand so tight. The priest said it was a first." Speaking of the special date, she said: "We planned the wedding in December because of Paul's training schedule and because he has a busy business - Paul Geaney's pub and restaurant in Dingle - so we said, 'Why not remember dad and do it around the anniversary too?'" The father-of-three died suddenly in 2012 at his home in Ventry near Dingle at the age of 57. O Se is considered one of the Kingdom's greatest players, lining out at right half back and winning eight All-Ireland medals. He also served as the Kerry, Clare and Westmeath manager and was a respcted columnist for the Sunday Independent. "I think of him every day but I thought of him on the day of the wedding especially. In the car on the way to the church when I had a quiet moment I thought of him. I was very fortunate to have Paidi to walk me down the aisle. Life has gone full circle. It made it a really happy day. "It was great from start to finish. "The one thing you can't plan for is the weather, especially in December, but the sun came out when we came out of the church so it was lovely," said Siun, who had a small picture of her father on a locket tied to her bouquet of white and red roses. Wearing a delicate lace and silk wedding gown and drop-diamond earrings, Siun looked the picture of elegance as she was accompanied to the church by her three bridesmaids - including sister Neasa - who were dressed in long black gowns. Her mother, Maire, wore a fuchsia dress and fascinator with a black stole. Paidi, who had trained Paul - now a star forward on the Kerry football team - as a schoolboy, was remembered in the speeches, along with Paul's mother Christina who Paul described as his "rock" and who he lost to cancer in 2014. The two had been long-time friends but became a couple in 2014. On their honeymoon plans, Siun said: "We are going to Amsterdam tomorrow until Thursday, but we kind of did it the opposite way around. Before the wedding we went to New York and Philadelphia and we might go away again in January." Geaney (27) has won back-to-back All-Star awards and won the Sam Maguire with Kerry back in 2014.